If you've never done it, now is the time! Clean your washing machine? Sounds kind of unnecessary doesn’t it? It might sound that way… but when you think about all the dirt and grime that cycles through your washer on a day-to-day basis, it starts to make a lot more sense! All of that dirt, grease, and grime can start to build up on the inside of your washing machine, which can make it less efficient and less effective. So taking a few hours to give your washing machine some TLC can make a big difference! After sifting through dozens of opinions on the topic of cleaning top-loading washing machines, I came up with the following method. I’ve been using this method on my HE washer every few months for several years now, and it always works wonderfully for me! I would recommend it to anyone with a top-loading machine. The keys to this method are bleach and vinegar. The bleach kills bacteria and mildew, while the vinegar dissolves soap scum and mineral deposits from the wash basket and hoses. The result is a washing machine that looks newer, smells better, and most importantly, works more effectively! Every washing machine should be cleaned at least twice per year. So let’s get down to it, shall we? Download the “How To Clean Your Top Load Washer” PDF Guide for easy reference. Click here! Fill the washer with HOT water. Add 1 quart of chlorine bleach – no detergent – and let the machine agitate for a minute, then let it sit for one hour. After one hour, allow the washer to run through its longest wash and spin cycle. Immediately fill the washer with HOT water again and add 1 quart distilled white vinegar. Let agitate for a minute, and again, let it sit for one hour. While it is soaking, dip a microfiber cloth or scrubber sponge in the vinegar water. Use your damp cloth to wipe down all the nooks and crannies of your washer, including the knobs, the lid and the exterior. 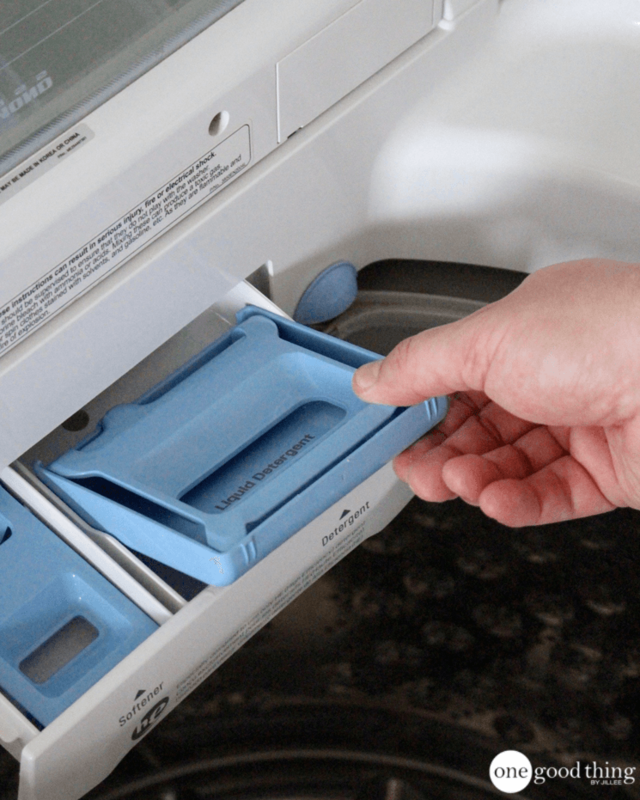 If your machine has built-in dispensers for fabric softener or bleach, clean those too. This is fairly simple if your dispensers have removable parts. After an hour of letting the vinegar soak, run the longest wash and spin cycle again. How To Make A Simple Floor Cleaner That Cuts The Grease! How To Clean Your Kitchen In 15 Minutes! I mix baking soda with my dish washing detergent. Finally my glasses come out sparkling clean. If you’re going to use a whole QUART of bleach, you’d better have EXCELLENT ventilation!! I have this exact same washer. When you say fill with hot water, what setting are you using? It doesn’t actually “fill” since it is an HE washer—it only fills to about 6″ or so. Is that ok? Do you use the “tub clean” setting? Do you put the bleach in the dispenser or right into ge tub? Thanks!! How would you recommend fixing your water dispenser? I have checked and double checked, even TRIPLE checked my hoses and they have no build up, but my cold water trickles in! Taking, no kidding, an hour to fill up a full load. I hate using warm/hot water because it’s not good on my wallet or clothes! Please help!!! I was looking for a way to clean my top loading washing machine thoroughly, it has a function of aqua preserve where it cleans if you select the option, after the light comes on, but I always doubted that cleaning, it uses a lot of water, and still its not thoroughly cleaned. Thank you. you should usually clean your washing machine every month or signature for protec your machine and your close. Thanks so much for this post! I’ve been using this recipe of yours for years! It works absolute wonders. I also wanted to add that I LOVE bleach!! :) and there is not one thing wrong with this recipe! I’ve had major success. Thanks again! The only thing is I can’t get the water to stay in there to soak for a whole hour because it drains it after a while even though it’s on pause . If you unplug the machine the water will not drain. Trust me…I tried everything else. I also can’t get it to full with hot water because it senses the load size and with nothing I it there isn’t much water in it. I have the same washer as in the article. Bleach and vinegar together makes chlorine gas… be careful people! You’re thinking of bleach and AMMONIA, which WILL cause very dangerous gas. My mother-in-law [many years ago] tried to clean with that mixture and suffered permanent lung damage from the fumes! But bleach and vinegar is safe when used one after the other.